What did you think about the Moderna campaign? Got a few minutes? We would love to hear from you about the Moderna campaign and “casting call” event in the HUB last week. Your thoughts about the campaign are important and will help us develop health related campaigns in the future. Please click this link to complete a short survey about the campaign. It should take you less than 5 minutes to complete. Your answers will be recorded anonymously. As alcohol companies increase their efforts to target women, a new crop of low-calorie products are popping up. Their sales pitch? You’ll get to enjoy an evening with your friends while not having to worry about how many calories are in your cocktail. However, when we compared the average number of calories in a shot of vodka to one popular “low-calorie” vodka brand, there was relatively little difference in the caloric values. For example, 1.5 oz. of a low-calorie vodka has about 75 calories. An average vodka shot has 98 calories. That’s only about a 20 calorie difference. Unlike food manufacturers, the alcohol industry isn’t required to provide nutrition information on their products, so it’s up to the customers to decipher if their slogans and strategies are really true. You also may have also noticed products with familiar candy or dessert flavors endorsed by hip, young celebrities. Those who don’t like the taste of liquor or beer might be convinced to try one with a sweet flavor like cotton candy, green apple or pumpkin pie. But who exactly is the intended consumer audience? According to data collected by The Center on Alcohol Marketing and Youth at Johns Hopkins University, girls ages 12-20 are exposed to more advertising for these types of products than women of legal drinking age. What do you think? Do these strategies leave a bitter taste in your mouth? For more information about alcohol and your health, check out the Rethinking Drinking website. The site contains interactive tools, including an alcohol calorie calculator. Have you been noticing more alcohol ads on TV? If you’re a female between 18-25, that may not be a coincidence. Across the U.S., research shows that women between 18-25 are engaging in the highest levels of binge drinking among all women. While this means scary consequences for their health, the alcohol industry smells opportunity. While college-aged men drink more overall, women in this age group are actually more likely than men to exceed the national weekly drinking guideline, surpassing the maximum of 7 drinks per week for women. This increase in high-risk drinking can certainly spell danger for women. Women get intoxicated more quickly than men because they typically have less body mass, lower levels of enzymes to metabolize the alcohol (called alcohol dehydrogenase), and fluctuating hormone levels. The risk isn’t just associated with binge-drinking or heavy-drinking. Even when drinking at lower levels, women still experience more consequences from alcohol. In the short term, this can mean a higher risk for sexual assault and alcohol poisoning. In the long term, it can mean an increased risk for brain, heart, pancreatic, and liver damage and even some cancers. So how much is too much? The USDA defines moderate drinking for women as up to one drink per day, meaning 12 ounces of beer, 5 ounces of wine, or 1.5 ounces of liquor. If you’re concerned about your alcohol use, you can speak with a health educator free of charge in a judgment-free, confidential environment at UHS. Visit us online or call us at 814-863-0461 and say, “I’d like to make a free appointment to talk to someone about alcohol.” Students who have an alcohol policy or legal violation (either on or off campus) and/or an alcohol-related emergency department visit are not eligible for the free self-referral service. To learn more about alcohol and women’s health, check out the National Institutes on Alcohol Abuse and Alcoholism (NIAAA) website. 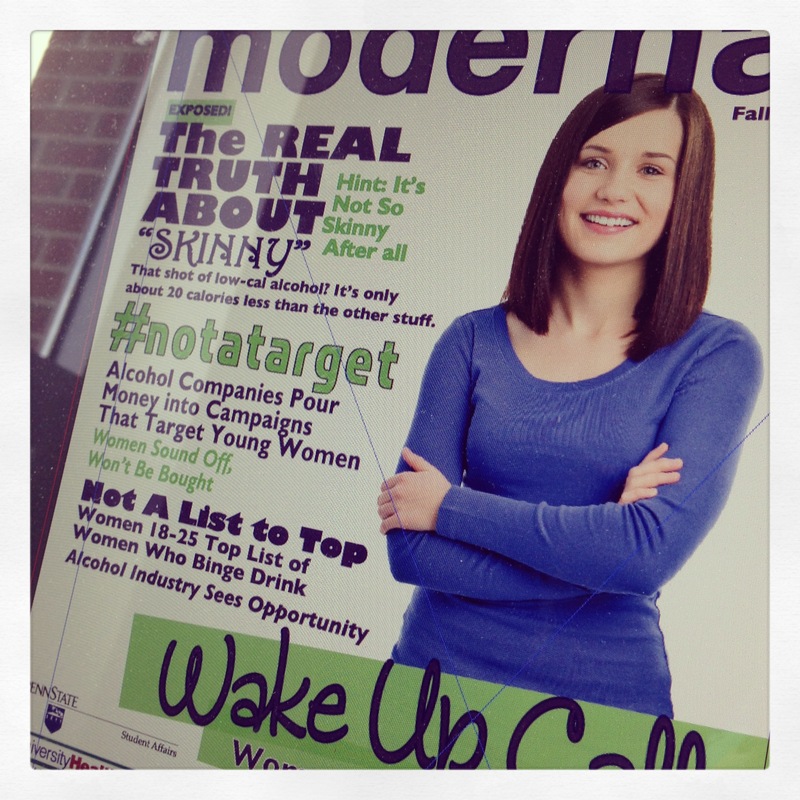 Want to be our Moderna cover girl? Stop by the HUB on Tuesday or Wednesday from 11-2 to see what all the buzz is about.